I first heard the tune A Wayfaring Stranger sung by Charlie Haden and his Quartet West on their album, The Art of the Song. Haunting. Excellent. I would never, ever, compare myself to this fantastic musician. But, when you enjoy a tune, you sing that tune! So, although you should seek out and listen to Mr. Haden’s version to see how it’s really done, that version did inspire an ukulele version which I recorded. It’s available on the Ukulele page, or you can listen here. Well, my wife and daughter were away visiting friends. It’s the weekend of my wife’s monthly visiting spree, and my daughter had recently gotten her driver’s license… so she was out spreading her wings. This situation left me all by myself last Saturday evening, and I thought to myself, “Self, what in the world am I going to do with this Bottom Round I have?” Options swirled before my eyes… pot roast… beef stew… But I had done those. Then I realized that there was something I had never tried (for whatever insane reason). I had never cut bottom round steaks! Well, situation solved. I cut a nice little 1/2 pound Bottom Round Steak out of that puppy, and got to planning the culinary event of the weekend. Bottom Round is pretty lean, but it’s very tough. 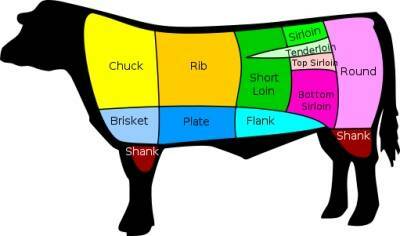 It’s part of the hip muscle, the big pink section in the image I stole from culinaryarts. Any “hard working” muscle (like the brisket, among others) can’t just be cooked up like a regular steak (e.g., rib eye, tenderloin, sirloin, etc. ), it’s got to go low and slow. This is the point I’d normally start referring to the Big Green Egg, but alas I do not have one at home (just at the office). So, I had to go with Plan B, and in this case the “B” stands for “Braising”! 2 thick slices of bread, I used garlic-asiago from my favorite bakery, The Bankery. Let the beer come to room temperature. Get a nice big frying pan with a cover, get it hot, add the oil, and let that get hot. Then, season the steak (salt, pepper, rub) and sear until well browned on each side, adding garlic after you turn the steak over. Add the beer all at once to the seared steak. Bring to a boil, then reduce heat to a simmer, and cover. Let this simmer for 1 hour. After an hour, remove the steak. The garlic will be super soft. Go ahead and eat one of the cloves! Save the other two. Add the two slices of bread to the juices in the pan, bring back to medium-high heat. Let the bread sit in the juices and fry. It will seem a little soggy at first, but don’t worry, it will recover as the liquid evaporates. Do this just on one side of the bread. The “fried side” will be the part we face to the inside of the sandwich, and the non-fried part will face out. That way, our hands don’t get too nasty and greasy. Not that it matters, but I just like the touch of fresh bread. Remove the bread, then add butter for the eggs. Fry the eggs anyway you like, I prefer over-easy with a little more salt & pepper. Just keep the yolks runny. On one slice of bread (on the fried side), spread a little mayo. On the other slice (also fried side), spread the soft garlic you saved. If you couldn’t help yourself and ate all the garlic already, just use more mayo. Finally, slice the steak and layer it on a slice of bread, followed by the eggs, a little more dry rub, and the avocado slices. Cut sandwich into two pieces… consume along with another beer. Why cut it into two pieces? Because anticipation is important in food… As you finish the first half of the sandwich, you’ll be all “O Dear Lord That Was Good!” but then you’ll realize that YOU’VE STILL GOT ANOTHER ONE! Then you’ll eat that second half all slow and deliberate, with a purpose and a plan, and the enjoyment will be enhanced. You might say, “Dude, I taste what I taste… what’s the difference in timing?” Don’t succumb to the lazy ways of eating!! Savor it. Maybe even wait a few minutes before eating that second half… let that anticipation build. So, I had this sequence of chords I was messing around with on the ukulele… 2 bars of C, a bar of G7, and then two bars of A minor and F. It was just a little fun, and those basic chords are really nothing spectacular; they’re the basis of just about every tune ever. Well, not all my goat memories are fond, so I went with the motorcycle idea. 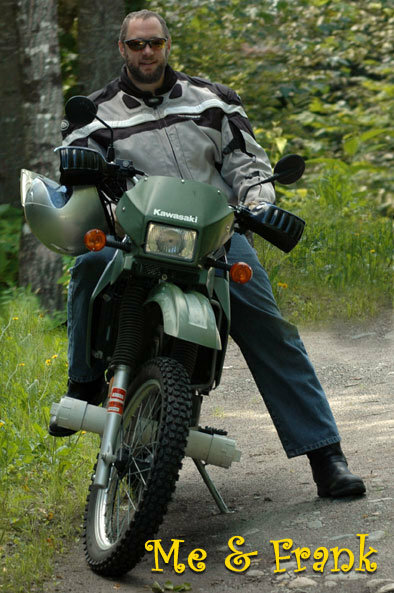 I have a KLR 650, named Frank (for Frankenstein, since he’s had so many new parts added to him over the years!). Frank is an Enduro, meaning I can ride trails or roads. I mostly use Frank to commute to work, but I argue that even the worst motorcycle ride is better than any ride in a car. I’ve ridden bikes since I was a kid on a JC Penny 5hp mini-bike. I love them. They are freeing. I’m also a Sci-Fi geek, so I figured I’d combine those two passions in this fun little tune. It’s on the Ukulele page, or you can listen to it here. The chart (chords, lyrics, strumming patterns) is also available. Well, no, yesterday wasn’t actually Boxing Day… it was last week. But I thought that was a fun title for the newest two entries on the Ukulele page… Yesterday (Paul McCartney) and The Boxer (Simon & Garfunkel). Back when I was a teenager, we had these things called cassettes… and cassette decks. I had an old office cassette deck, about the size of a big paperback. It was grey and black, and had a bright red “record” button so that you knew if you were supposed to speak cautiously. I loved it. I listened to my tapes on that stupid cassette deck’s tinny, single speaker for hours and hours and hours. Mostly, my tape collection consisted of the Beatles, Billy Joel, and Simon & Garfunkel. Oh, and Supertramp, but I don’t discuss that in … um … well, in public. Damn. Anyway, it would be a couple of years before I discovered that classical music and Broadway tunes also came on tape, so I was stuck with what I had. For this New Year’s Eve, we decided (by “we” I mean my wife, daughter, and me) to hors d’oeuvre our way to midnight, rather than prepare a normal dinner. I went out and got us each a specific cheese (wife = garden Jack, daughter = Bergenost, me = Espresso BellaVitano) to accompany various other bits on some crackers. The other bits included some sliced Jazz apples, some hard salami, and some Supreme Guacamole! Oh, and the wine… although not fancy, the Beringer White Zinfandel is something of an “in” joke between my wife and me, so it got the nod for the evening. To be fair, I’m the only one who eats guac at our house. Probably, this is because I make it with a nice kick. However, since it was New Year’s Eve, my wife decided to try a bite. After I recovered from the punch she gave me, we resolved that she wouldn’t have to eat this guac anymore… but that I would eat it weekly! Take that, woman! Is this guac that blazing hot? No, not really… I only use one jalapeno and a little crushed red pepper. Although I’ve made it with “hotter” ingredients and amounts, I find that too much more kills the other flavors. On the other hand, my wife will tell you that I’ve already killed all the flavors! So, please adjust as necessary… but try it this way, at least once! The other thing about this particular recipe is that it lacks cilantro. I’m normally a fan of cilantro in guacamole, but not always. This is one of those cases of “not always.” I find it competes too much with the garlic. With all the flavor happening here, I don’t miss it at all with this recipe. But if you must have it, toss in a small hand full… reduce the garlic by half, and maybe toss in a Roma tomato, too. Cut everything up in rough chunks, and get the food processor out. Couldn’t be simpler… run everything in the food processor until you’ve got a mostly creamy combination. I like to leave a few random chunks in there, just for texture. Serve on the crackers, cheese, and salami, or use (more often, for me) as a spread on burgers, or a topping for tacos. Well, one of the few TV shows, musical styles, etc., that my daughter and I have in common is Glee. Yes, I’m a Gleek. They do really interesting arrangements of songs that I probably would never have listened to otherwise, as well as great standards. So, through Glee I got to hear this crazy fun arrangement of Over the Rainbow, which, I later learned (while inter-tubing to find the chords and lyrics so I could learn to play it) was originally done this way by a fellow named Israel Kamakawiwo’ole (aka, Brudda Iz), an amazing ukulele player and singer whom I had never, ever heard before. Apparently, you can find about a trillion versions of this song out there… but I wanted to record it anyway! So, it’s on the ukulele page, or you can listen here. Beethoven. On the ukulele. Don’t hate, now… I remember hearing the 9th Symphony for the first time and thinking to myself, “Holy crap, what just happened?” In a good way, in a good way! I was blown away, all the intricate vocal lines going in and out of the finale… the Ode to Joy. Whatever troubles Beethoven created for his loved ones, by being so cantankerous, perhaps they forgave him after they heard the 9th! So, I put the basic theme of the Ode to Joy to the ukulele, and some whistling (with harmony! ), and the “well known” lyrical verse, all on the ukulele page. Or, give it a listen here. Our office likes to celebrate with food, and the holidays are one of the best excuses to do so early and often! For our office pot-luck holiday buffet, I decided that in addition to the turkey (which a friend did on her rotisserie, and it was awesome! ), I would grill up some pork tenderloin on the Egg. Why tenderloin? Well, because we hadn’t done that, yet! I had recently made apricot glazed pork chops for the wife and daughter, to positive reviews, so I knew that I wanted to do something with apricots for these tenderloins. I had also had some baklava at our local bakery, and that got me thinking in a Greek sort of manner. Finally, earlier in the month I had made a mushroom gravy for some steaks we had at home, so I knew I wanted something with mushrooms, too! Well, Pork Tenderloin Three Ways was born! Along the way, I also had to learn to butterfly pork tenderloin, and substitute a small glass for a tenderizing hammer… Clearly, I need more kitchen gadgets! After butterflying the tenderloin, I “hammered” it flat and added one of the stuffings (in this case, the spinach – feta – sun dried tomato). Then, wrapped it all up and closed it with toothpicks. Big handful of fresh spinach, roughly cut. For the Apricot – Gruyere, I put about a cup of water in a small pot and added the apricots. Got it to boil, then reduced heat (but kept boiling). Boiled down to 1/2 volume. Added another cup of water. Continued to boil down until roughly 1/2 cup liquid was remaining. Added the honey. Continued to boil another few minutes, then added the brandy. Cooked until thick. You can add the cheese to the mix at this point, or wait until you’re assembling the pork. For the Spinach – Feta – Sun dried tomato, I got a skillet hot, added the oil. Added garlic, crushed red pepper, and sun dried tomatoes. Let a slight char form on the tomatoes. Added spinach all at once, and continued heating until spinach lost some volume, but was still bright green (i.e., don’t cook it until it shrivels into nothing). Removed from heat. At this point you can stir in the feta if you want, or just add it later when you prepare the pork roll. Finally, for the Wild Mushroom – Bacon – Shallot, I got a skillet hot, and added bacon. Cooked until medium crisp, and reserved 2 T of the grease in the skillet. Chopped the bacon, and set it aside. In the same skillet, added reserved grease, got it hot again, and added shallots and garlic. Sauted until just softening. Added salt and the mushrooms. Sauted until mushrooms shrank a little. Added lots of freshly ground black pepper, along with the bacon. Heated it all through. Alright, time to bring in the Egg! I got the Egg up to 400F, set for direct heat. I brushed each tenderloin with olive oil, and did the same to the grill. The plan was to get the tenderloin onto the grill by 11:15, grill them for about 30 minutes, then have them rest another 10 minutes before slicing, and then serving at noon. Oddly enough, it actually worked out that way! Just before I added the tenderloin to the Egg, I tossed on a handful of apple wood chips. As the tenderloin grilled, I turned them every 5 minutes or so, for a total of about 35 minutes. I used a remote thermometer, and was going for an internal temperature of 140F. Once they hit that (after 35 minutes), I pulled them off and let them rest. Finally, we sliced and enjoyed! Personally, my favorite was the Spinach – Feta – Sun dried tomato… The tomatoes were so concentratedly sweet, with the touch of crushed red pepper and smooth feta cheese… Sakes alive! All in all, a great time on the Egg, and when you added in all the other pot-luck items, it was a real feast! We decided an office Thanksgiving celebration was in order. Several things helped us reach this conclusion… 1) it’s near Thanksgiving, 2) we like getting the whole office together for a meal, 3) we really like getting together for a Big Green Egg meal, and 4) we had never tried a turkey on the Egg. Case closed – it was time for a turkey on the Egg that would feed everyone and make us all happy! Crazy expectations, ho! Having never smoked a turkey on the Egg, I did a bit of research on the interwebs and googletubes, and decided that I would brine the turkey first, then estimate about 20 minutes per pound at 300F, but pull it off early if we hit 160F internal. I decided not to use any flavored chips, because I didn’t want to overpower the brine or the aromatics I was going to add. We got our turkey, a 24 pound Butterball, and set to work. First up was to just let the turkey sit in the refrigerator for a couple of days. It wasn’t quite enough… when we opened it up to prep for the brine dunk, the bird was still pretty well frozen. So, what’s a Mainer to do? I had my friend reach his hand into the frozen bird and wrestle out the giblets and neck! Of course, we were running cold water over it the whole time to aid in the extraction… It was quite the show of suction noises and gushing water. Hey, thanks, Derek! The plan was to let the bird sit in the brine for about 36-48 hours, which we did do. Mix all the brining ingredients in a large bowl. Add a gallon of water and dissolve as much as possible. Pour into large plastic bag (large enough to hold the turkey plus liquid… we used clear plastic liner bags and tied off the excess) or a plastic tub (if using this option, use one that is a tight fit for the turkey to ensure full coverage by the liquid). Pour another gallon of water into the bowl and dissolve any remaining salt & sugar, then add to the bag. Add remaining two gallons of water to bag, then lift the turkey into the bag. Tie it off so that the turkey is fully surrounded by liquid. Then, swish it around a bunch to finish mixing. We then set the bag into a large plastic tub, filled the tub with clear water, covered it, and set it out in our un-heated entry way. Thanks to a vent, the entry way would not get below freezing (it’s November in Maine… so cold is an issue at night), and it also wouldn’t get too warm during the day. The bird thus sat for roughly 40 hours. The day of the feast, I arrived at the office at 0200 (that’s 2 a.m. for you civilians) and prepared the aromatics, removed the turkey from the brine and rinsed it off, and got the Big Green Egg firebox started. I fashioned some grill handles out of heavy duty electric fence wire (donated from our horses… I did ask permission, but ignored all the nays), set the turkey on it, then stuffed that puppy with the aromatics. Stuffed both in the large cavity, and up front under the breasts. I also decided to cut up some extra potatoes, and put them in the drip pan along with apple juice. Just for grins, I squeezed some lemon juice onto the turkey. Once the Egg had stabilized (all vents open) at 350F, I put the bird on, at 0330. The temperature dipped to about 250, then slowly started to climb. At that point, I cut the vents to about 50% each, and monitored the temperature about every 30 minutes, keeping it between 250 and 350F. My plan was to let it smoke until about 1130, then let it rest 20 minutes before carving… serving at noon. Eh, that’s sort of how it worked out! Keep in mind, it’s November in Maine… the overnight temperature was under 20F… and that meant that the Egg had to consume more fuel to maintain its 300F average temperature. I should have known this, but when I filled the firebox I was a little groggy from lack of sleep… so at about 0930, we ran out of fuel! Fortunately, the aforementioned Derek was in the office, too, and as I lifted the turkey out of the Egg, he tossed in more charcoal onto the remaining embers. Also fortunately, we caught it in time for there to be embers, and they started the new charcoal up quickly. In the meantime, we had our turkey covered in foil in the kitchen… hoping for the best. Even with the interruption in cook time, we hit our desired internal temperature (160 in the breast, 175 in the thigh) early, by 1115. So, off it came, and I just let it rest a full half hour before starting to carve. All the while, the hustle and bustle of the rest of the office was going on as other folks brought in some fantastic sides and deserts! We also had a bit of a grill vs grill thing going… another friend had brought in her small Traeger smoker to put some smokey goodness into a ham (the ham was pre-cooked, so just needed some flavor). It was a great day! For carving, I wanted everyone to get a bit of all the good parts, so I pulled it all apart and sliced up the breast so there was a bit of skin down to a bit of tenderloin in every serving. I left the drumsticks and wings whole, but sliced up the thighs for lovely dark meat. Well, then the best part… the eating! I have never, ever had turkey that was this smooth, this moist, and this absolutely delicious! And I’ve eaten a lot of turkey in my days… but the brine and the Egg really just did a fabulous job. In a way, I felt bad… lots of comments were of the form, “Well, thanks, now you’ve ruined my own Thanksgiving, because I know the turkey won’t be this good!” Sorry, guys! But my plan for my own turkey, since I don’t have an Egg at home, is to still use the brine process… I think that did the majority of the work, tenderizing and moisturizing the bird. So, we’ll still have an oven roasted (rather than smoked) turkey, but it will be brined, and I bet it will be almost as good as what we all got to experience the other day.